People who have Bishvili Nivra Ha'olam Syndrome are people who do things they want to do as if there were no one else around and as if their actions do not affect others. Those afflicted with this syndrome do things like stop their cars in the middle of the street to talk to their friends - blocking all traffic in the process. They park their cars in three parking spaces. They appear in line for the bank teller or the barber for whom you have waited for half an hour just as it's about to be your turn, and claim "it's my turn now; I went out for a little while." Or they sell their Israeli passports abroad without thinking about who the buyers might be. Fortunately, the Interior Ministry is about to take action to deal with the latter kind of selfishness. Following warnings from Interpol that something must be done to stem the high number of Israelis who sell their passports abroad, the Interior Ministry is pushing through legislation to introduce new biometric passports by the end of next year. A biometric passport is a combined paper and electronic identity document that uses biometrics to authenticate the citizenship of travelers. The passport's critical information is stored on a tiny computer chip, much like information stored on smart cards. The Interior Ministry also wants to significantly increase the cost new passports for people who lose their existing document. It currently costs NIS 450 for anyone who has reported a passport as missing or stolen to be issued a new one. The Interior Ministry wants that fee increased to thousands of shekels to discourage possible fraud. In 2005, Interpol approached Israel following increasing reports of Israeli passports reaching criminal elements in a number of countries. The problem was reported to be especially prevalent in India, Australia, Japan and Thailand. 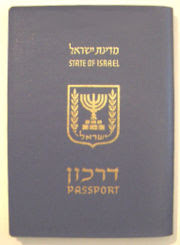 Interpol warned Israel that if action were not taken, a number of countries would soon stop honoring Israeli passports. Some 27,000 Israeli passports are reported stolen or missing each year, 500 of which go missing each month in foreign countries. Interior Ministry officials believe that the overwhelming majority of missing passports are the result of loss or theft. However, there have been growing reports in recent years of cash-strapped Israelis abroad, mainly backpackers, selling their passports to finance the remainder of their trip. There have also been reports of Israelis who were expelled from a foreign country reentering after obtaining a new passport back in Israel. While some of the passports have fallen into criminal hands, a greater fear is that the "missing" Israeli passports may end up in the hands of terrorists. I'm not crazy about them raising the fees to 'thousands of Shekels' - passports can also be legitimately lost or stolen. But the biometrics makes sense, and I would gladly pay extra for the technology assuming that the passport will have a longer validity period. Israeli passports are currently valid for ten years, but that was increased from five plus a five-year extension just a couple of years ago.